The Microsoft Word document format is widely used in many corporate and educational environments, particularly where the Windows platform is dominant. For Mac users who work with the Pages app for word processing, a simple option to improve cross-platform document readability and compatibility is to save (or export) a Pages file as a Word .doc or .docx file. Fortunately, the Pages app makes saving as Word files very easy, and there are several compatibility choices available during the export process. This process covers exporting a file as a Word document using the latest version of Pages. 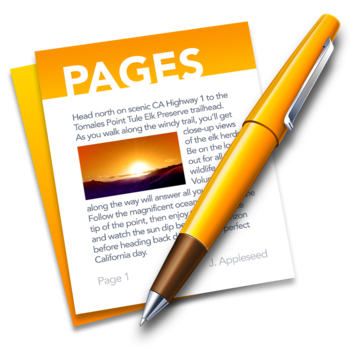 Prior versions of Pages also support saving as Word .doc format, but they handle the process slightly differently – for the most part it’s similar enough that this walkthrough will continue to make sense, even if the Mac is running a fairly ancient version of Pages app. With that said, Pages is now offered as a free Mac app from Apple, so if you have an older version, you can update to the newest version with the latest features from the Mac App Store. Having the newest version of Pages is also recommended for improved compatibility when saving the Word documents, particularly as .docx format. Your newly created Word file, either in .doc or .docx format, will be saved wherever you specified. For the most part, Pages app will produce very compatible word files without any effort, and the resulting .doc or .docx file will open without incident in Microsoft Word and look basically identical as it started. If something doesn’t look right with the saved file, it’s usually due to complex formatting, an unique font, or the usage of stylized ascii, Emoji, and special characters that are unique to Mac OS X and the Pages app. With that in mind, it’s good practice to keep the saved/exported files fairly simple and using standardized fonts that are available across-platforms, and avoiding any unusually complex document formatting whenever possible. That’s typically not an issue for a text-heavy document or a simple report, and the converted file should open flawlessly in Microsoft Office whether on another Mac or a Windows PC. Finally, if you or the recipient is using a Windows PC and is unable to access Pages to re-save the file into a Word compatible format, another option is to open a .pages format file in Windows using this renaming trick, but while that method works in a pinch, it’s not necessarily ideal, as it sometimes strips unique formatting or leads to odd formatting issues within the Pages file that gets loaded into Word on the PC. 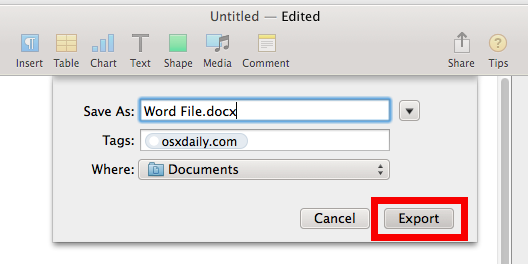 For that reason, if you (or the document recipient) do have access to a Mac, it’s best to just re-save the file as Word to begin with. Do you know of any other helpful tricks or tips to save or export Pages files as Microsoft Office / Word document formats? Share with us in the comments below! Pro tip: Set up a custom keyboard combination for Export to>Word and it’s even easier. When I export a Pages file to Word, it cones with a blank/gray/ugly icon ! Is there anyway to change it to Pages or Word icon? Thank you for this great tip. I was literally about to buy Microsoft Office (I only need MS Word so I can send docs to PC users) but when I saw their subscription pricing model, which is very expensive, I decided to look for an alternative. As usual, Apple has it covered. LOL , replied to like a Apple-Hater.. I have office and iWork. I am trying pages right now, but still use word for some things. Is this overly complicated or am I just mis-reading something? When I need to save a Word version in Pages, I click “File” – “Save As” …and in the lower-third of the window that pops-up I check the box “Save Copy As Word Document”. The saved file shows up as both a Pages doc and a Word doc. Can the exported docs from Pages be edited as if they are normal Word docs? Any thoughts about converting many documents at the same time? I have several policy books that I have been asked to tweak for an organization, but I am having to convert each document singularly. Is there a way to find the documents, highlight them, then convert all at the same time? This would be great except for the fact that Pages takes a 200 kb file and converts it into a bloated 1.5 MB file! This bug has been in pages since 5.2 and they STILL haven’t fixed it. I have the opposite effect: going from pages 5.6.1 a file that is 638 kb to a word file, it is only 20 kb! Poor me, as I am forced to use Apple at work. Is there any way to change the settings, so that it saves it automatically as a word-file every time? To the ones who said ” great, apple has it covered” etc, this whole pages-thing seems way more complicated than it needs to be. Even OpenOffice seems like a gem compared to it! “When I need to save a Word version in Pages, I click “File” – “Save As” …and in the lower-third of the window that pops-up I check the box “Save Copy As Word Document”. I believe there is only one reason folks are getting double documents (Pages and Word). When you create a document and Save As in .doc or .docx format don’t Save it as a Pages format when you Quit Pages. It appears to always ask when you close Pages. Just click Don’t Save. When I convert from Pages to Word, and then read the conversion, the page breaks are not in the same place. The conversion in .docx has more lines to the page than the original. In reading the .docx I am of course converting it back to Pages, since I don’t have Word installed, but I assume that the .docx version also has more lines to the page than the Pages original. Inserting page breaks in the original does not help (and would not be much of a solution for a document of any size). If you export the document once, and then edit it do you have to export it again? Or once its exported it’s fine to resend to my usb? I have been struggling because I have not been able to to save to word, so I am elated, this is the best. I can’t getting the “WORD” option. so how can I enable word option in my MacBook Pro. 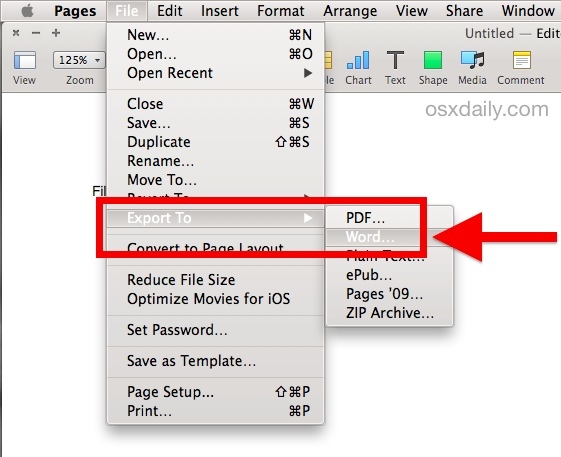 You must use the Pages app on you MacBook Pro, then you can get the Word option for saving. Update your Pages app too. When you open a “.doc” file in pages, how do you get Pages to automatically save it as a “.doc” file? Is there a setting in Preferences I am missing? If you open a “.doc”, “.txt”, “.rtf” file in Microsoft Word, or LibreOffice Writer, for instance, those programs automatically save the file in the same correct format. Pages wants to save it as a “.pages” file which is not correct, and a bit of BS if you ask me. When I go to share the file with work, where we don’t have Mac computers, or even to my Android phone, I then can’t open the file I edited on my Mac, unless I go through the annoying extra steps of Exporting it back into the native format it was already in to begin with. Come on, Mac. Get with the times! Anyone have a better solution than this? Thanks. Here is an article that shows you how to save from Pages as a DOC file. Pages makes pages documents as its default save format, so to save as a Word document you have to export it as a Word doc. That’s how nearly all applications on all computers work – you can often save as other file formats, but you’re saving as or exporting to that other file type. Thank you, but that is a link to *this* article on *this* page. This didn’t solve my problem, so I commented. Let me explain myself better. What I am looking for is a way to get Pages to save any file I open in the same format it was in originally. When I open and edit a “.doc” file, for instance, it makes sense that when I press Command-S to save the file, it should save as a “.doc” file. LibreOffice does it. MS Office does it. Pages *should* do it, but I haven’t found the setting yet. I am hoping there is a Preferences setting for that somewhere that I haven’t come across yet. It is clunky and annoying to have to take the extra steps involved in exporting it, by going into the menus to “File | Export to | Word…”, then going into the “Advanced Options” to find the setting to save it as a “.doc” file (instead of the default “.docx”), every time I need to make a change to it from home. Why a “.doc” file you are probably asking yourself. Well, the video rental software (yes, we still rent videos are our grocery store. We’re old-school that way.) that we use is a DOS program. And we have Office 2003 installed on that computer without an easy way to update it. It still works, so we’re not fixing what isn’t broken. Pages, however, is very slightly broken in this regard, and I’m looking for a fix. I see, I understand exactly what you are saying now. While that does sound very convenient and it would make some degree of sense, I am not sure that Pages will do that however. Pages wants to save files in the Pages file format, unless chosen otherwise on a per-save (export) basis. But Pages can save files in Word (doc and docx) format if desired, it just must be exported that way. I do not think there is a workaround to that, as it is just how Pages behaves. As for .doc / docx file format, those are so widely used I am not surprised that you use them as many businesses do. Word is a very standard file format. The challenge then will be the saving behavior as you see now. It would probably be best to get in the habit of using the Export -> Word for each individual file save, even if that’s annoying and requires a change of work flow. You could make it a little easier by assigning a keystroke to it, but it would still require manually saving those files as Word DOC files from Pages on the Mac. You could also try and use something like Microsoft Office / Word, or even LIbreOffice, or OpenOffice, to open the doc file instead, but I am not familiar enough with their saving behavior to know if they’d be much different. Your comment here of “It still works, so we’re not fixing what isn’t broken.” I think is very wise. I have learned the same over my computing career. Sometimes the ‘new’ is not better, it is just new. In fact, sometimes the new is worse! Therefore if something works great, that is often OK, even if it is outdated. The old adage “if it ain’t broke, don’t fix it” applies to modernity! Anyway good luck, what you describe sounds like it would be desirable to many, but I am not sure that Pages makes it a possibility for automatically saving to Word documents if the origin document is a Word file… If you do find a solution please share it here, as I think others may find it useful as well. I’ve been trying to convert a file that has 2 bits of art on it, and it does convert to word & opens on my mac, but when I try to attach it to email, it hangs up. Is there a way I can check codes to see what might be the problem? Does the doc need flattening, like in AI?